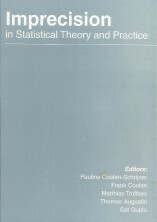 Containing 5 chapters on Statistical Modeling; Distribution Theory; Design of Experiments; Statistical Inference and Applied Statistics with introduction by Ricardas Zitikis (University of Western Ontario, Canada); Frank P.A. Coolen (Durham University, UK);Viatcheslav B Melas (St Petersburg State University, Russia) ; J.C.W. Rayner (University of Newcastle, Australia) and Jerry Reiter (Duke University, UK) respectively.